This article is about the Soviet rocket. For the Japanese rocket, see N-I (rocket). The N1 (Russian: Н1, from Ракета-носитель, Raketa-nositel, Rocket-carrier) was a super heavy-lift launch vehicle intended to deliver payloads beyond low Earth orbit, acting as the Soviet counterpart to the US Saturn V. It was designed with manned extra-orbital travel in mind. Development work started on the N1 in 1959. Its first stage is the most powerful rocket stage ever built. The N1-L3 version was designed to compete with the United States Apollo program to land a man on the Moon, using the same lunar orbit rendezvous method. The basic N1 launch vehicle had three stages, which was to carry the L3 lunar payload into low Earth orbit with two cosmonauts. The L3 contained an Earth departure stage; another stage used for mid-course corrections, lunar orbit insertion, and powered descent initiation; a single-pilot LK Lander spacecraft; and a two-pilot Soyuz 7K-LOK lunar orbital spacecraft for return to Earth. The Apollo spacecraft was able to carry three astronauts (landing two on the Moon), and relied on the Saturn V's third stage for Earth departure. N1-L3 was underfunded and rushed, starting development in October 1965, almost four years after the Saturn V. The project was badly derailed by the death of its chief designer Sergei Korolev in 1966. Each of the four attempts to launch an N1 failed; during the second launch attempt the N1 rocket crashed back onto its launch pad shortly after liftoff and exploded, resulting in one of the largest artificial non-nuclear explosions in human history. The N1 program was suspended in 1974, and in 1976 was officially canceled. Along with the rest of the Soviet manned lunar programs, the N1 was kept secret almost until the collapse of the Soviet Union in December 1991; information about the N1 was first published in 1989. Development began under the direction of Sergei Korolev at his OKB-1 Design Bureau. 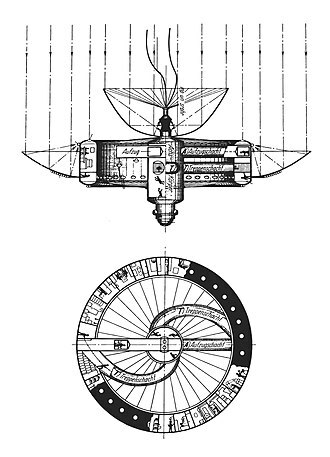 The original design proposed a 50-metric-ton (110,000 lb) payload intended as a launcher for military space stations and a manned flyby of Venus and Mars in the TMK (Russian acronym for Heavy Interplanetary Spacecraft) using a nuclear engine upper stage. The N1 was the largest of three proposed designs; the N2 was somewhat smaller and intended to compete with Vladimir Chelomei's proposed UR-200, and the much smaller N3, which would replace Korolev's "workhorse" R-7 rocket. At this point the N-series was strictly a "paper project". In December 1959, a meeting was called with all of the chief designers, who presented their latest designs to the military. Korolev presented the N-series along with a much more modest series of upgrades to the R-7. Vladimir Chelomei, Korolev's rival, presented his "Universal Rocket" series, which used a common lower stage in various clustered configurations to meet a wide variety of payload requirements. Mikhail Yangel, perhaps the most successful of the three but with little political power, presented the small R-26 intended to replace the R-16, the much larger R-36 ICBM, as well as the SK-100, a space launcher based on a huge cluster of R-16's. In the end the military planners selected Chelomei's UR-100 as the new "light" ICBM, and Yangel's R-36 for the "heavy" role. They saw no need for any of the larger dedicated launchers, but also gave Korolev funding to develop the Molniya (8K78) adaptation of the R-7. In March 1961, during a meeting at Baikonur, designers discussed the N1 design, along with a competing Glushko design, the R-20. In June, Korolev was given a small amount of funding for N1 development between 1961 and 1963. In May 1961 a government report, On Reconsideration of the Plans for Space Vehicles in the Direction of Defense Purposes, set the first test launch of the N1 rocket for 1965. When the US announced in May 1961 the goal of landing a man on the Moon, Korolev proposed a lunar mission based on a new spacecraft, eventually known as Soyuz, that was designed for Earth orbit rendezvous. Several launches would be used to build up a complete Moon mission package, one for the Soyuz, another for the lunar lander, and additional launches with cislunar engines and fuel. This approach makes the least demands on the launch vehicle, as the payload mass is reduced for any one launch. This is at the expense of requiring a rapid launch rate to ensure that the modules are built up before running out of consumables while waiting on-orbit. Even using this profile the lunar boosters and fuel were too large for any existing Soviet launcher, and Korolev proposed the N1 be used for this role. To power the new design, Valentin Glushko, who then held a near-monopoly on rocket engine design in the Soviet Union, proposed a new engine, the RD-270, running on unsymmetrical dimethylhydrazine (UDMH) and nitrogen tetroxide (N2O4). This formula is hypergolic (i.e., its components ignite on contact, reducing the complexity of the combustion system), and was widely used in Glushko's existing engine designs used on various ICBMs. The propellant pair UDMH/N2O4 has a lower potential specific impulse than kerosene/liquid oxygen, but because the RD-270 used the much more efficient full flow staged combustion cycle, as opposed to the simple gas-generator cycle used on the American F-1 rocket engine, the specific impulse of the RD-270 was higher than the F-1. There were strong personal resentments between the two, Korolev holding Glushko responsible for his incarceration at Kolyma Gulag and Glushko considering Korolev to be irresponsibly cavalier and autocratic in his attitudes towards things outside his competence. Glushko refused outright to work on LOX/kerosene engines, and with Korolev in general. He instead teamed up with other rocket designers to build the very successful Proton, Zenit and Energia rockets. The difference of opinions led to a falling out between Korolev and Glushko. In 1962, a committee that was appointed to break the logjam agreed with Korolev. Since Glushko refused to work on such a design, Korolev eventually gave up and decided to enlist the help of Nikolai Kuznetsov, the OKB-276 jet engine designer. Kuznetsov, who had limited experience in rocket design, responded with a fairly small engine known as the NK-15, which would be delivered in several versions tuned to different altitudes. To achieve the required amount of thrust, it was proposed that a large number of NK-15s would be used in a clustered configuration around the outer rim of the lower-stage booster. The "inside" of the ring of engines would be open, with air piped into the hole via inlets near the top of the booster stage. The air would be mixed with the exhaust in order to provide thrust augmentation, as well as additional combustion with the deliberately fuel-rich exhaust. The ring-like arrangement of so many rocket engine nozzles on the N1's first stage could have been an attempt at creating a crude version of a toroidal aerospike engine system; more conventional aerospike engines were also studied. Meanwhile, Chelomei's OKB-52 proposed an alternate mission with much lower risk. Instead of a manned landing, Chelomei proposed a series of circumlunar missions which he felt would be able to beat the US. He also proposed a new booster for the mission, clustering three of his existing UR-200 designs (known as the SS-10 in the west) to produce a single larger booster, the UR-500. These plans were dropped when Glushko offered Chelomei the RD-270, which allowed the construction of a much simpler "monoblock" design, also known as the UR-500. He also proposed adapting an existing spacecraft design for the circumlunar mission, the single-cosmonaut LK-1. Chelomei felt that improvements in early UR-500/LK-1 missions would allow the spacecraft to be adapted for two cosmonauts. The Soviet military, specifically the Strategic Missile Forces, was reluctant to support what was essentially a politically motivated project with little military utility, but both Korolev and Chelomei pushed for a lunar mission. For some time, between 1961 and 1964, Chelomei's less aggressive proposal was accepted, and development of his UR-500 and the LK-1 were given a high priority. 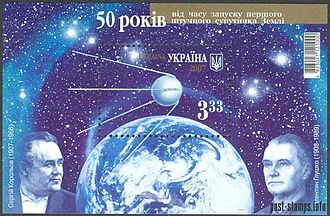 Since the US Project Gemini reversed the Soviet lead in human space exploration by 1966, Korolev was able to persuade Leonid Brezhnev to let him pursue his plans to make a lunar landing before the US. This required much larger boosters. 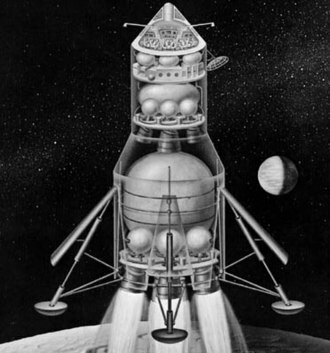 Korolev proposed a larger N1, combined with a new lunar package known as the L3. The L3 combined the lunar engines, an adapted Soyuz spacecraft (the LOK) and the new LK lunar lander in a single package. Chelomei responded with a clustered UR-500-derived vehicle, topped with the L1 spacecraft already under development, and a lander of their own design. Korolev's proposal was selected as the winner in August 1964, while Chelomei was told to continue with his circumlunar UR-500/L1 work. When Khrushchev was overthrown later in 1964, infighting between the two teams started anew. 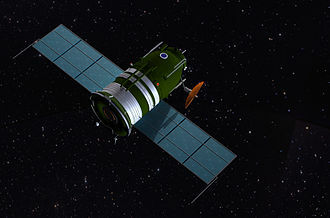 In October 1965, the Soviet government ordered a compromise; the circumlunar mission would be launched on Chelomei's UR-500 using Korolev's Soyuz spacecraft in place of their own Zond ("probe") design, aiming for a launch in 1967, the 50th anniversary of the Bolshevik Revolution. Korolev, meanwhile, would continue with his original N1-L3 proposal. Korolev had clearly won the argument, but work on the L1 continued anyway, as well as the Zond. Korolev died in 1966 due to complications after minor surgery, and the work was taken over by his deputy, Vasily Mishin. Mishin did not have Korolev's political astuteness or influence, and was reputed to be a heavy drinker. These problems contributed to the eventual downfall of the N1, and of the lunar mission as a whole. The N1 was a very large rocket, standing 105 meters (344 ft) tall with its L3 payload. The N1-L3 consisted of five stages in total: the first three (N1) for insertion into a low Earth parking orbit, and another two (L3) for translunar injection and lunar orbit insertion. Fully loaded and fueled, the N1-L3 weighed 2,750 tonnes (6,060,000 lb). The lower three stages were shaped to produce a single frustum 17 meters (56 feet) wide at the base, while the L3 section was mostly cylindrical, carried inside a shroud an estimated 3.5 meters (11 feet) wide. The conical shaping of the lower stages was due to the arrangement of the tanks within, a smaller spherical kerosene tank on top of the larger liquid oxygen tank below. The first stage, Block A, was powered by 30 NK-15 engines arranged in two rings, the main ring of 24 at the outer edge of the booster and the core propulsion system consisting of the inner 6 engines at about half diameter. The engines were the first ever staged combustion cycle engines. The control system was primarily based on differential throttling of the engines of the outer ring for pitch and yaw. The core propulsion system was not used for control. The Block A also included four grid fins, which were later used on Soviet air-to-air missile designs. In total, the Block A produced 45,400 kN (10,200,000 lbf) of thrust. This exceeded the 33,700 kN (7,600,000 lbf) thrust of the Saturn V. The Saturn V used higher-specific impulse liquid hydrogen fuel in the second and third stages, which eliminated one of the stages needed to get to translunar injection, thus saving weight. The second stage, Block B, was powered by 8 NK-15V engines arranged in a single ring. The only major difference between the NK-15 and -15V was the engine bell and various tunings for air-start and high-altitude performance. The upper stage, Block V (В/V being the third letter in the Russian alphabet), mounted four smaller NK-21 engines in a square. During the N1's lifetime, a series of improved engines was introduced to replace those used in the original design. The first stage used an adaptation of the NK-15 known as the NK-33, the second stage a similar modification known as the NK-43, and finally the third stage used the NK-31. The resulting modified N1 was known as the N1F, but did not fly before the project's cancellation. The KORD (Russian acronym for KOntrol Raketnykh Dvigateley—literally "Control (of) Rocket Engines"—Russian: Контроль ракетных двигателей) was the automatic engine control system devised to throttle, shutdown and monitor the large cluster of 30 engines in Block A (the first stage). The KORD system controlled the differential thrusting of the outer ring of 24 engines for pitch and yaw attitude control by throttling them appropriately and it also shut down malfunctioning engines situated opposite each other. This was to negate the pitch or yaw moment diametrically opposing engines in the outer ring would generate, thus maintaining symmetrical thrust. Block A could perform nominally with two pairs of opposing engines shut down (26/30 engines), Block B with one pair of opposing engines shutdown (6/8 engines) and Block V with one engine shut down (3/4 engines). Unfortunately the KORD system was unable to react to rapidly occurring processes such as the exploding turbo-pump during the 5L launch. Due to the deficiencies of the KORD system a new computer system was developed for the last launch, vehicle 7L, called the S-530. It was the first Soviet digital guidance and control system. At 105 meters (344 ft), the N1-L3 was slightly shorter and more slender overall, than the American Apollo-Saturn V (111 meters, 363 ft), but wider at the base (17 m/56 ft vs. 10 m/33 ft). The N1 produced more thrust in each of its first three stages than the corresponding stages of the Saturn V. It also produced more total impulse in its first four stages than the Saturn V did in its three (see table below). The N1 was intended to place the ≈95 t (209,000 lb) L3 payload into low Earth orbit, whereas the Saturn V placed the roughly 45 t (100,000 lb) Apollo spacecraft, plus 74.4 t (164,100 lb) of fuel for translunar injection, into Earth parking orbit. L3 translunar injection of a 23.5 t (52,000 lb) payload was to be provided by the fourth stage. The N1-L3 would have been able to convert only 9.3% of its three-stage total impulse into Earth orbit payload momentum (compared to 12.14% for the Saturn V), and only 3.1% of its four-stage total impulse into translunar payload momentum, compared to 6.2% for the Saturn V.
The N1-L3 used only kerosene-based rocket fuel in all three of its stages, while the Saturn V used liquid hydrogen to fuel its second and third stages, which yielded an overall performance advantage due to the higher specific impulse. 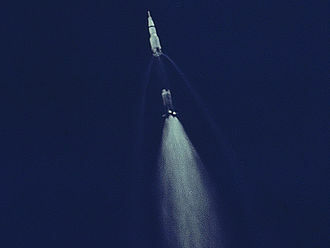 The N1 also wasted available propellant volume by using spherical propellant tanks under its conical-shaped external skin, while the Saturn V used most of its available cylindrical skin volume to house capsule-shaped hydrogen and oxygen tanks, with common bulkheads between the tanks in the second and third stages. The Saturn V also had a superior reliability record: it never lost a payload in two development and eleven operational launches, while four N1 development launch attempts all resulted in failure, with two payload losses. Complex plumbing was needed to feed fuel and oxidizer into the clustered arrangement of rocket engines. This proved to be extremely fragile, and was a major factor in the design's launch failures. 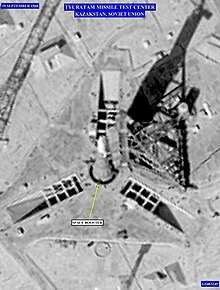 Furthermore, unlike Kennedy Space Center Launch Complex 39, the N1's Baikonur launch complex could not be reached by heavy barge. To allow transport by rail, all of the stages had to be shipped in pieces and assembled at the launch site. The engines for Block A were only test-fired individually and the entire cluster of 30 engines was never static test fired as a unit. 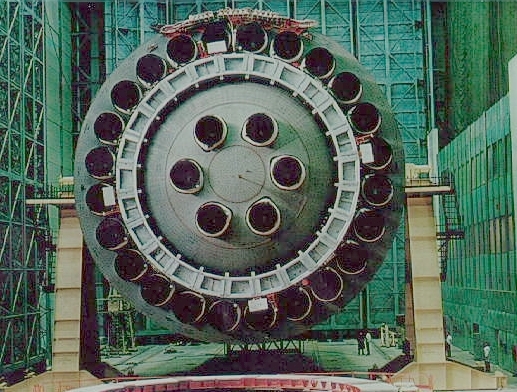 Sergei Khrushchev stated that only two out of every batch of six engines were tested, and not the units actually intended for use in the booster. The reason for this was that the NK-15 engines had a number of valves that were activated by pyrotechnics rather than hydraulic or mechanical means, this being a weight-saving measure. Once shut, the valves could not be re-opened. As a result, the complex and destructive vibrational modes (which ripped apart propellant lines and turbines) as well as exhaust plume and fluid dynamic problems (causing vehicle roll, vacuum cavitation, and other problems) in Block A were not discovered and worked out before flight. Blocks B and V were static test fired as complete units. Because of its technical difficulties and lack of funding for full-up testing the N1 never completed a test flight. All four unmanned launches out of 12 planned tests ended in failure, each before first-stage separation. The longest flight lasted 107 seconds, just before first-stage separation. Two test launches occurred in 1969, one in 1971, and the final one in 1972. Mishin continued with the N1F project after the cancellation of plans for a manned Moon landing, in the hope that the booster would be used to build a moonbase. The program was terminated in 1974 when Mishin was replaced by Glushko. Two N1Fs were being readied for launch at the time, but these plans were canceled. The program was followed by the "Vulkan" concept for a huge launch vehicle (with Syntin/LOX, later replaced by LH2/LOX as fuel on the 2nd and 3rd stages), and then in 1976, by the commencement of the Energia/Buran program. N1 1L – full scale dynamic test model, each stage was individually dynamically tested; the full N1 stack was only tested at 1/4 scale. N1 2L (1M1) – Facilities Systems Logistic Test and Training Vehicle (FSLT & TV); two first stages painted gray, third stage gray-white and L3 white. N1 3L – first launch attempt, engine fire, exploded at 12 km. N1 4L – Block A LOX tank developed cracks; never launched, parts from Block A used for other launchers; rest of airframe structure scrapped. N1 5L – partially painted gray; first night launch; launch failure destroyed pad 110 East. N1 6L – launched from the second pad 110 West, deficient roll control, destroyed after 51s. N1 7L – all white, last launch attempt; engine cutoff at 40 kilometres (22 nmi) caused propellant line hammering, rupturing the fuel system. N1 8L and 9L – flight ready N1Fs with improved NK-33 engines in Block A, scrapped when the program was canceled. N1 10L – uncompleted, scrapped along with 8L and 9L. 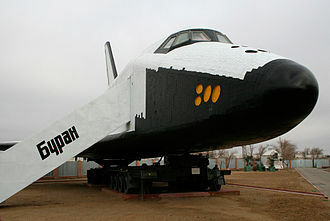 The two flight-ready N1Fs were scrapped and their remains could still be found around Baikonur years later used as shelters and storage sheds. The boosters were deliberately broken up in an effort to cover up the USSR's failed moon attempts, which was publicly stated to be a paper project in order to fool the US into thinking there was a race going on. This cover story lasted until glasnost, when the remaining hardware was seen publicly on display. The advanced engines for the N1F escaped destruction. Although the rocket as a whole was unreliable, the NK-33 and NK-43 engines are considered rugged and reliable when used as a standalone unit. About 150 engines survived, and in the mid-1990s, Russia sold 36 engines to the US company Aerojet General for $1.1 million each and also license for the production of new engines. The US company Kistler Aerospace worked on incorporating these engines into a new rocket design, with which Kistler sought to eventually offer commercial launch services, before declaring bankruptcy. Aerojet also modified the NK-33 to incorporate thrust vector control capability for Orbital Science's Antares launch vehicle. Antares used two of the modified NK-33s, which Aerojet renamed the AJ-26, for first stage propulsion. The first four launches of the Antares were successful, but on the fifth launch the rocket exploded shortly after launch. Preliminary failure analysis by Orbital pointed to a possible turbopump failure in one NK-33/AJ-26. Given Aerojet's previous problems with the NK-33/AJ-26 engine during the modification and test program (two engine failures in static test firings, one of which caused major damage to the test stand) and the later in-flight failure, Orbital decided that the NK-33/AJ-26 was simply not reliable enough for future use. 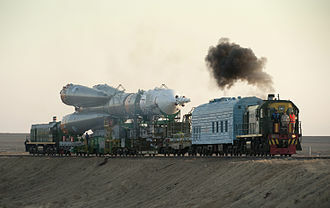 In Russia, N1 engines were not used again until 2004, when the remaining 70 or so engines were incorporated into a new rocket design, the Soyuz 3. As of 2005[update], the project has been frozen due to the lack of funding. Instead, the NK-33 was incorporated into the first stage of a light variant of the Soyuz rocket, which was first launched on 28 December 2013. A few seconds into launch, a transient voltage caused the KORD to shut down Engine #12. After this happened, the KORD shut off Engine #24 to maintain symmetrical thrust. At T+6 seconds, pogo oscillation in the #2 engine tore several components off their mounts and started a propellant leak. At T+25 seconds, further vibrations ruptured a fuel line and caused RP-1 to spill into the aft section of the booster. When it came into contact with the leaking gas, a fire started. The fire then burned through wiring in the power supply, causing electrical arcing which was picked up by sensors and interpreted by the KORD as a pressurization problem in the turbopumps. The KORD responded by issuing a general command to shut down the entire first stage at T+68 seconds into launch. This signal was also transmitted up to the second and third stages, "locking" them and preventing a manual ground command from being sent to start their engines. Telemetry also showed that the power generators in the N-1 continued functioning until impact with the ground at T+183 seconds. Investigators discovered the remains of the rocket 32 miles (52 kilometers) from the launch pad. Vasily Mishin had initially blamed the generators for the failure, as he could not think of any other reason why all 30 engines would shut down at once, but this was quickly disproven by telemetry data and the recovery of the generators from the crash site. They had survived in good condition and were shipped back to the Istra plant, where they were refurbished and worked without any problems under bench testing. The investigative team did not speculate as to whether the burning first stage could have continued flying if the KORD system had not shut it down. The KORD was found to have a number of serious design flaws and poorly programmed logic. One unforeseen flaw was that its operating frequency, 1000 Hz, happened to perfectly coincide with vibration generated by the propulsion system, and the shutdown of Engine #12 at liftoff was believed to have been caused by pyrotechnic devices opening a valve, which produced a high frequency oscillation that went into adjacent wiring and was assumed by the KORD to be an overspeed condition in the engine's turbopump. The wiring in Engine #12 was believed to be particularly vulnerable to this effect due to its length; however, other engines had similar wiring and were unaffected. Also, the system ended up drawing 25V instead of its designed 15V due to the ruptured power lines. The control wiring was relocated and coated with asbestos for fireproofing and the operating frequency changed. The launch escape system was activated and did its job properly, saving the mockup of the spacecraft. All subsequent flights had freon fire extinguishers installed next to every engine. According to Sergei Afanasiev, the logic of the command to shut down the entire cluster of 30 engines in Block A was incorrect in that instance, as the subsequent investigation revealed. The second N-1 vehicle carried a modified L1 Zond spacecraft and live escape tower. Boris Chertok claimed that a mass model lunar module was also carried; however, most sources indicate that only the L1S-2 and boost stages were on board N-1 5L. Launch took place at 11:18 PM Moscow time. For a few moments, the rocket lifted into the night sky. As soon as it cleared the tower, there was a flash of light, and debris could be seen falling from the bottom of the first stage. All the engines instantly shut down except engine #18. This caused the N-1 to lean over at a 45-degree angle and drop back onto launch pad 110 East. The nearly 2300 tons of propellant on board triggered a massive blast and shock wave that shattered windows across the launch complex and sent debris flying as far as 6 miles (10 kilometers) from the center of the explosion. Launch crews were permitted outside half an hour after the accident and encountered droplets of unburned RP-1 still raining down from the sky. The majority of the N-1's propellant load had not been consumed in the accident, and most of what had burned was in the first stage of the rocket. However, the worst-case scenario, mixing of the RP-1 and LOX to form an explosive gel, had not occurred. The subsequent investigation revealed that up to 85% of the propellant on board the rocket did not detonate, reducing the force of the blast. The launch escape system had activated at the moment of engine shutdown (T+15 seconds) and pulled the L1S-2 capsule to safety 1.2 miles (2 kilometers) away. Impact with the pad occurred at T+23 seconds. Launch Complex 110 East was thoroughly leveled by the blast, with the concrete pad caved in and one of the lighting towers knocked over and twisted around itself. Despite the devastation, most of the telemetry tapes were found intact in the debris field and examined. Just before liftoff, the LOX turbopump in the #8 engine exploded (the pump was recovered from the debris and found to have signs of fire and melting), the shock wave severing surrounding propellant lines and starting a fire from leaking fuel. The fire damaged various components in the thrust section leading to the engines gradually being shut down between T+10 and T+12 seconds. The KORD had shut off engines #7, #19, #20, and #21 after detecting abnormal pressure and pump speeds. Telemetry did not provide any explanation as to what shut off the other engines. Engine #18, which had caused the booster to lean over 45 degrees, continued operating until impact, something engineers were never able to satisfactorily explain. It could not be determined exactly why the #8 turbopump had exploded. Working theories were that either a piece of a pressure sensor had broken off and lodged in the pump, or that its impeller blades had rubbed against the metal casing, creating a friction spark that ignited the LOX. The #8 engine had operated erratically prior to shutdown and that a pressure sensor detected "incredible force" in the pump. Vasily Mishin believed that a pump rotor had disintegrated, but Alexander Kuznetsov argued that the NK-15 engines were entirely blameless and Mishin, who had defended the use of Kuznetsov's engines two years earlier, could not publicly come out and challenge him. Kuznetsov succeeded in getting the postflight investigative committee to rule the cause of the engine failure as "ingestion of foreign debris". Vladimir Barmin, chief director of launch facilities at Baikonur, also argued that the KORD should be locked for the first 15–20 seconds of flight to prevent a shutdown command from being issued until the booster had cleared the pad area. The destroyed complex was photographed by American satellites, disclosing that the Soviet Union was building a Moon rocket. After this flight, fuel filters were installed in later models. It also took 18 months to rebuild the launch pad and delayed launches. This was one of the largest artificial non-nuclear explosions in human history and was visible that evening 22 miles (35 kilometres) away at Leninsk (See Tyuratam). Soon after lift-off, due to unexpected eddies and counter-currents at the base of Block A (the first stage), the N-1 experienced an uncontrolled roll beyond the capability of the control system to compensate. 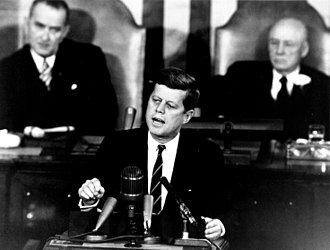 The KORD computer sensed an abnormal situation and sent a shutdown command to the first stage, but as noted above, the guidance program had since been modified to prevent this from happening until 50 seconds into launch. The roll, which had initially been 6° per second, began rapidly accelerating. At T+39 seconds, the booster was rolling at nearly 40° per second, causing the inertial guidance system to go into gimbal lock and at T+48 seconds, the vehicle disintegrated from structural loads. The interstage truss between the second and third stages twisted apart and the latter separated from the stack and at T+50 seconds, the cutoff command to the first stage was unblocked and the engines immediately shut down. The upper stages impacted about 4 miles (7 kilometers) from the launch complex. Despite the engine shutoff, the first and second stages still had enough momentum to travel for some distance before falling to earth about 9 miles (15 kilometers) from the launch complex and blasting a 15-meter-deep (50-foot) crater in the steppe. This N1 had dummy upper stages without the rescue system. The next, last vehicle would have a much more powerful stabilization system with dedicated engines (in the previous versions stabilization was done by directing exhaust from the main engines). The engine control system would also be reworked, increasing the number of sensors from 700 to 13,000. The start and lift-off went well. At T+90 seconds, a programmed shutdown of the core propulsion system (the six center engines) was performed to reduce structural stress on the booster. Because of excessive dynamic loads caused by a hydraulic shock wave when the six engines were shut down abruptly, lines for feeding fuel and oxidizer to the core propulsion system burst and a fire started in the boattail of the booster; in addition, the #4 engine exploded. The first stage broke up starting at T+107 seconds and all telemetry data ceased at T+110 seconds. The launch escape system activated and pulled the Soyuz 7K-LOK to safety. The upper stages were ejected from the stack and crashed into the steppe. An investigation revealed that the abrupt shutdown of the engines led to fluctuations in the fluid columns of the feeder pipes which ruptured and spilled fuel and oxidizer onto the shut down, but still hot, engines. A failure of the #4 engine turbopump was also suspected. It was believed that the launch could have been salvaged had ground controllers sent a manual command to jettison the first stage and begin second stage burn early. Vehicle serial number 8L was prepared for August 1974. It included a regular 7K-LOK Soyuz 7K-LOK and a regular LK module-spacecraft of the L3 lunar expedition complex. It was intended for a Moon flyby and unmanned landing in preparation for a future manned mission. As the N1-L3 program was canceled in May 1974, this launch never took place. There is confusion among Russian online sources as to whether N1-L3 (Russian: Н1-Л3) or N1-LZ (Russian: Н1-ЛЗ) was intended, because of the similarity of the Cyrillic letter Ze for "Z" and the numeral "3". Sometimes both forms are used within the same Russian website (or even the same article). English sources refer only to N1-L3. The correct designation is L3, representing one of the five branches of Soviet lunar exploration. Stage 1 (Л1) would be a manned circumlunar flight (only partially realized); stage 2 (Л2) would be an unmanned lunar rover (realized as Lunokhod), stage 3 (Л3) would be the manned landing, stage 4 (Л4) would be a manned spacecraft in lunar orbit, and stage 5 (Л5) would be a heavy manned lunar rover to support a crew of 3–5 people. ^ Zak, Anatoly. "Soviet N1 moon booster". russianspaceweb.com. Anatoly Zak. Retrieved 24 January 2015. ^ Barensky, C. Lardier, Stefan (2013). The Soyuz launch vehicle the two lives of an engineering triumph. New York: Springer. p. 82. ISBN 978-1-4614-5459-5. ^ "N1". Encyclopedia Astronautica. Retrieved 2011-09-07. ^ a b "The N1 Moon Rocket - a brief History". Retrieved 2013-01-01. ^ Wade, Mark. "Korolev, Chelomei, and Glushko - A Work In Progress". astronautix. astronautix.com. Retrieved 19 January 2019. ^ Lindroos, Marcus. "THE SOVIET MANNED LUNAR PROGRAM" (PDF). Massachusetts Institute of Technology. MIT OpenCourseWare. Retrieved 19 January 2019. ^ Zak, Anatoly. "N1 moon rocket". RussianSpaceWeb.com. Anatoly Zak. Retrieved 24 January 2015. ^ Capdevila, Didier. "N1 Block A Motors". CapcomEspace.com. capcom espace, l'encyclopédie de l' espace - 2000-2012 Didier Capdevila. Retrieved 18 February 2015. ^ Chertok, Boris E. (2011). Rockets and people (PDF). Washington, DC: NASA. p. 199. ISBN 978-0-16-089559-3. Retrieved 21 January 2015. ^ a b c Harford, James (1997). Korolev : how one man masterminded the Soviet drive to beat America to the moon. New York ; Chichester: Wiley. p. 199. ISBN 9780471327219. ^ a b Jr, Robert C. Seamans, (2007). Project Apollo: The Tough Decisions. Washington D.C.: NASA. p. 120. ISBN 978-0-16-086710-1. ^ Wade, Mark (1997–2008). "N1". Encyclopedia Astronautica. Retrieved 2009-04-25. ^ Wade, Mark (1997–2008). "Saturn V". Encyclopedia Astronautica. Archived from the original on 2011-10-07. Retrieved 2009-04-25. ^ "Контроль ракетных двигателей - Monitoring the Functioning of the Elements of Rocket Engines". radian-spb.ru. 2014 RADIAN. Retrieved 3 February 2015. ^ Harford, James (1997). Korolev : how one man masterminded the Soviet drive to beat America to the moon. New York ; Chichester: Wiley. p. 294. ISBN 9780471327219. ^ Gainor, Chris (2001). Arrows to the Moon. Burlington, Ontario: Apogee Books. pp. 155ñ156. ISBN 978-1-896522-83-8. ^ Harford, James (1997). Korolev: how one man masterminded the Soviet drive to beat America to the moon. New York; Chichester: Wiley. p. 271. ISBN 978-0-471-32721-9. ^ Orloff, Richard W (2001). Apollo By The Numbers: A Statistical Reference. NASA. Also PDF format. Accessed February 19, 2008 Published by Government Reprints Press, 2001, ISBN 1-931641-00-5. ^ Harford, James (1997). Korolev : how one man masterminded the Soviet drive to beat America to the moon. New York ; Chichester: Wiley. p. 304. ISBN 9780471327219. ^ "Complex N1-L3 - Tests". S.P. Korlev Rocket and Space Corporation Energia - History. 2000 - 2013 Official website of S.P. Korolev RSC "Energia". Retrieved 30 January 2015. ^ Petrovitch, Vassili. "Vulkan Description". Buran-Energia.com. 2006-2015 by Vassili Petrovitch. Retrieved 31 January 2015. ^ Wade, Mark. "Vulkan". Astronautix.com. Encyclopedia Astronautica. Archived from the original on 31 March 2015. Retrieved 31 January 2015. ^ Vick, Charles P.; Berman, Sara D.; Lindborg, Christina. "The First Photograph of N1-L3 FSLT & TV (1M1) on the Pad. KH-4 CORONA Product Mission: 1102-1 -- 11 December 1967 -- Frame A065". GlobalSecurity.org. 2000-2015 GlobalSecurity.org. Retrieved 1 March 2015. ^ Vick, Charles P. "Unmasking N1-L3 An In-depth Analysis of a Critical Aspect of the Cold War: The Soviet Manned Lunar Programs, from the American and Russian Perspective". GlobalSecurity.org. 08-16-04, Revealing Some of the Top Secret Follow-on Reconnaissance Satellite Imagery & Data from Open Sources, By Charles P. Vick, 1999-04. Retrieved 23 February 2015. ^ Vick, Charles P.; Berman, Sara D.; Lindborg, Christina. "N1-L3 (1M1) on the Launch Pad". GlobalSecurity.org. 2000-2015 GlobalSecurity.org. Retrieved 24 February 2015. ^ Dawson, Linda (2016-11-22). The Politics and Perils of Space Exploration: Who Will Compete, Who Will Dominate?. Springer. p. 14. ISBN 9783319388137. ^ Rhian, Jason (24 November 2014). "Orbital's Cygnus - on a SpaceX Falcon 9? 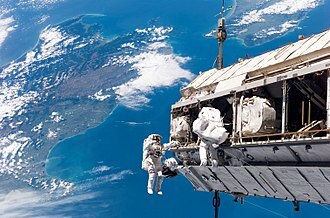 - SpaceFlight Insider". Spaceflight Insider. Spaceflight Insider. Retrieved 13 February 2016. ^ Harvey, Brian (2007). The rebirth of the Russian space program 50 years after Sputnik, new frontiers (1st ed.). New York: Springer. p. 201. ISBN 978-0-387-71356-4. ^ Zak, Anatoly. "The history of the Soyuz-3 launch vehicle". russianspaceweb.com. Russian Space Web. Retrieved 27 January 2015. 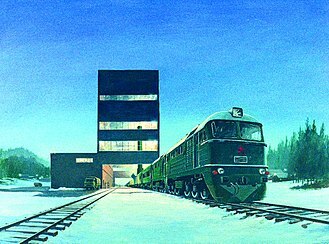 ^ "Soyuz 2-1v". Spaceflight 101. Retrieved December 28, 2013. ^ Wade, Mark. "1969.02.21 - N1 3L launch". Encyclopedia Astronautica. Mark Wade - Encyclopedia Astronautica. Archived from the original on 5 August 2014. Retrieved 5 February 2015. ^ Harvey, Brian (2007). Soviet and Russian lunar exploration. Berlin: Springer. p. 222. ISBN 0387739769. ^ a b c d "Die russische Mondrakete N-1 (in German)". ^ Harford, James (1997). Korolev : how one man masterminded the Soviet drive to beat America to the moon. New York; Chichester: Wiley. p. 294. ISBN 9780471327219. ^ Zak, Anatoly. "N1 No. 3L launch". RussianSpaceWeb.com. Anatoly Zak. Retrieved 5 February 2015. ^ "N1 (vehicle 5L) moon rocket Test - launch abort system activated". YouTube.com. 2015 YouTube, LLC. Retrieved 12 January 2015. ^ Zak, Anatoly (6 November 2014). "The second launch of the N1 rocket (Largest explosion in space history rocks Tyuratam) - The aftermath". RussianSpaceWeb.com. Russian Space Web. Retrieved 24 May 2015. ^ Harford, James (1997). Korolev : how one man masterminded the Soviet drive to beat America to the moon. New York; Chichester: Wiley. p. 295. ISBN 9780471327219. ^ Reynolds, David West (2002). Apollo: The Epic Journey to the Moon. San Diego, CA 92121: Tahabi Books. p. 162. ISBN 0-15-100964-3. ^ Wade, Mark. "1969.07.03 - N1 5L launch". astronautix.com. Encyclopedia Astronautica. Archived from the original on 2014-10-24. Retrieved 2 February 2018. ^ Harford, James (1997). Korolev : how one man masterminded the Soviet drive to beat America to the moon. New York; Chichester: Wiley. p. 298. ISBN 9780471327219. ^ "Complex N1-L3 - Launches". S.P. Korolev Rocket and Space Corporation Energia. 2000 - 2013 Official website of S.P. Korolev RSC Energia. Retrieved 21 February 2015. ^ Harford, James (1997). Korolev : how one man masterminded the Soviet drive to beat America to the moon. New York; Chichester: Wiley. p. 300. ISBN 9780471327219. ^ К 40-летию посадки на Луну первого самоходного аппарата "Луноход 1"
"N1". Encyclopedia Astronautica. Retrieved 2008-06-23. Matthew Johnson (2014-03-01). "N-1: For the Moon and Mars A Guide to the Soviet Superbooster". ARA Press; First edition. ISBN 9780989991407. Wikimedia Commons has media related to N-1 (rocket). The R-36 is a family of intercontinental ballistic missiles and space launch vehicles designed by the Soviet Union during the Cold War. The original R-36 was deployed under the GRAU index 8K67 and was given the NATO reporting name SS-9 Scarp and it was able to carry three warheads and was the first Soviet MIRV missile. The version, the R-36M was produced under the GRAU designations 15A14, some versions of the R-36M were deployed with 10 warheads and up to 40 penetration aids and the missiles high throw-weight made it theoretically capable of carrying more warheads or penetration aids. Contemporary U. S. missiles, such as the Minuteman III, Russia intends to replace the R-36 with a new heavy ICBM, the RS-28 Sarmat. The R-36 is a rocket powered by a liquid bipropellant, with UDMH as fuel. It carries one of two types of vehicles developed especially for this missile, SS-9 Mod 1 single nuclear warhead of 18 megatons TNT. The development of the R-36 missile complex for use with the 8К69 began on April 16,1962, such a missile provided some advantages over a conventional ICBM. Due to the possibility of placing the warhead in orbit and keeping it there for some time, it is possible to reduce the time required to strike to just a few minutes. It is more difficult to predict where the warhead will land. Moreover, since the warhead can be commanded to land anywhere along the ground track. The structure and design of the fractional orbit bombardment system were similar to a conventional R-36 ICBM system. The main design difference from a conventional ICBM was in the design of the vehicle, which is fitted with a single 2.4 Mt warhead, a de-orbit engine. The silo launcher and command point were hardened against a nuclear blast, the Soviet Union constructed two surface pads at Baikonur for R-36 tests at LC-67/1 and LC-67/2, and six silos. The first launch of an R-36 took place on September 28,1963 and ended ignominiously when the missile lost thrust one second after liftoff and fell back onto the pad and this debacle led to program director V. P. Petrov being fired and replaced by V.
The UR-100 was an intercontinental ballistic missile developed and deployed by the Soviet Union from 1966 to 1996. 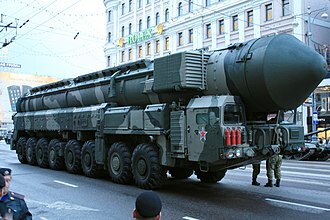 УР in its designation stands for Универсальная Ракета and it was known during the Cold War by the NATO reporting name SS-11 Sego and internally by the GRAU index 8K84. The similar designation UR-100MR actually refers to a different missile. The UR-100 was a two-stage liquid-propellant lightweight ICBM, initial versions carried a single warhead of 0.5 to 1.1 Mt yield, while versions could carry three or six MIRV warheads. 15P784 silo design was simplified in comparison to earlier missiles. Facilities consisted of hardened, un-manned silos controlled by a central command post. This was the first soviet ICBM equipped with missile defense countermeasure Palma by NII-108 of V. Gerasimenko, UR-100 with 8K84 missile — original development UR-100 with 8K84M missile — improved variant UR-100N with 15A30 missile — enlarged UR-100. This variant is the basis of the Rokot space launch system, an additional 420 launchers of newer version missiles were added by 1976. In spaceflight, a launch vehicle or carrier rocket is a rocket used to carry a payload from Earths surface into outer space. A launch system includes the launch vehicle, the launch pad, Earth orbital launch vehicles typically have at least two stages, and sometimes as many as four or more. Expendable launch vehicles are designed for one-time use and they usually separate from their payload and disintegrate during atmospheric reentry. In contrast, reusable vehicles are designed to be recovered intact. The Space Shuttle was a part of a vehicle with components used for multiple orbital spaceflights. SpaceX has developed a rocket launching system to successfully bring back a part—the first stage—of their Falcon 9 and launch it again. A fully reusable VTVL design is planned for all parts of the ITS launch vehicle, Launch vehicles are often classified by the amount of mass they can carry into orbit. For example, a Proton rocket can lift 22,000 kilograms into low Earth orbit, Launch vehicles are characterized by their number of stages. Rockets with as many as five stages have been successfully launched, launch vehicles are very often supplied with boosters supplying high early thrust, normally burning with other engines. Boosters allow the engines to be smaller, reducing the burnout mass of stages to allow larger payloads. Other frequently reported characteristics of vehicles are the launching nation or space agency. For example, the European Space Agency is responsible for the Ariane V, many launch vehicles are considered part of a historical line of vehicles of same or similar name, e. g. the Atlas V is the latest Atlas rocket. A small-lift launch vehicle is capable of lifting up to 2,000 kg of payload into low Earth orbit, a medium-lift launch vehicle is capable of lifting 2,000 to 20,000 kg of payload into LEO. A heavy-lift launch vehicle is capable of lifting 20,000 to 50,000 kg of payload into LEO, a super-heavy lift vehicle is capable of lifting more than 50,000 kg of payload into LEO. It refers to its 1,500 kg to LEO Vega launch vehicle as light lift, sounding rockets have long been used for brief, inexpensive unmanned space and microgravity experiments. Specific impulse is a measure of the efficiency of rocket and jet engines. By definition, it is the total impulse delivered per unit of propellant consumed and is equivalent to the generated thrust divided by the propellant flow rate. If mass is used as the unit of propellant, specific impulse has units of velocity, if weight is used instead, specific impulse has units of time. Multiplying flow rate by the gravity before dividing it into the thrust. In rockets, this means the engine is more efficient at gaining altitude and this is much less of a consideration in jet engines that employ wings and outside air for combustion to carry payloads that are much heavier than the propellant. Specific impulse includes the contribution to impulse provided by air that has been used for combustion and is exhausted with the spent propellant. Jet engines use air, and therefore have a much higher specific impulse than rocket engines. The specific impulse in terms of propellant mass spent is in units of distance per time and this is higher than the actual exhaust velocity because the mass of the combustion air is not being accounted for. Actual and effective exhaust velocity are the same in rocket engines not utilizing air, Specific impulse is inversely proportional to specific fuel consumption by the relationship Isp = 1/ for SFC in kg/ and Isp = 3600/SFC for SFC in lb/lbf-hr. The amount of propellant is normally measured either in units of mass or weight, however, if propellant weight is used, an impulse divided by a force turns out to be a unit of time, and so specific impulses are measured in seconds. These two formulations are both used and differ from each other by a factor of g0, the dimensioned constant of gravitational acceleration at the surface of the Earth. Note that the rate of change of momentum of a rocket per unit time is equal to the thrust, the higher the specific impulse, the less propellant is needed to produce a given thrust during a given time. In this regard a propellant is more efficient the greater its specific impulse and this should not be confused with energy efficiency, which can decrease as specific impulse increases, since propulsion systems that give high specific impulse require high energy to do so. Valentin Petrovich Glushko, was a Soviet engineer, and designer of rocket engines during the Soviet/American Space Race. At the age of fourteen he became interested in aeronautics after reading novels by Jules Verne and he is known to have written a letter to Konstantin Tsiolkovsky in 1923. He studied at an Odessa trade school, where he learned to be a metal worker. After graduation he apprenticed at a hydraulics fitting plant and he was first trained as a fitter, moved to lathe operator. During his time in Odessa, Glushko performed experiments with explosives and these were recovered from unexploded artillery shells that had been left behind by the White Guards during their retreat. From 1924-25 he wrote concerning the exploration of the Moon. He attended Leningrad State University where he studied physics and mathematics and he reportedly left without graduating in April,1929. From 1929-1930 he pursued research at the Gas Dynamics Laboratory. A new research section was set up for the study of liquid-propellant. 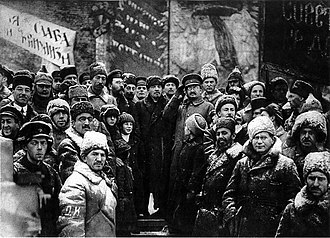 He became a member of the GIRD, founded in Leningrad in 1931, on 23 March 1938 he became caught up in Joseph Stalins Great Terror and was rounded up by the NKVD, to be placed in the Butyrka prison. By 15 August 1939 he was sentenced to eight years in the Gulag, despite his supposed imprisonment, Glushko was put to work on various aircraft projects with other arrested scientists. In 1941 he was placed in charge of a bureau for liquid-fueled rocket engines. He was finally released in 1944 by special decree, in 1944, Sergei Korolyov and Glushko designed the RD-1 KhZ auxiliary rocket motor tested in a fast-climb Lavochkin La-7R for protection of the capital from high-altitude Luftwaffe attacks. At the end of World War II, Glushko was sent to Germany, in 1946, he became the chief designer of his own bureau, the OKB456, and remained at this position until 1974. This bureau would play a prominent role in the development of engines within the Soviet Union. His OKB456 would design the 35-metric ton thrust RD-101 engine used in the R-2, the 120-ton thrust RD-110 employed in the R-3, the R-7 would include four of Glushkos RD-107 engines and one RD-108. Soyuz is a series of spacecraft designed for the Soviet space programme by the Korolyov Design Bureau in the 1960s that remains in service today. The Soyuz succeeded the Voskhod spacecraft and was built as part of the Soviet manned lunar programs. The Soyuz spacecraft is launched on a Soyuz rocket, the most frequently used, the Soyuz rocket design is based on the Vostok launcher, which in turn was based on the 8K74 or R-7A Semyorka, a Soviet intercontinental ballistic missile. All Soyuz spacecraft are launched from the Baikonur Cosmodrome in Kazakhstan, the first Soyuz flight was unmanned and started on November 28,1966. The first Soyuz mission with a crew, Soyuz 1, launched on 23 April 1967 but ended with a due to a parachute failure. Soyuz 3, launched on October 26,1968, became the programs first successful manned mission, the only other flight to suffer a fatal accident, Soyuz 11, killed its crew of three when the cabin depressurized prematurely just before reentry. These were the humans to date to have died above the Kármán line. Despite these early incidents, Soyuz is widely considered the worlds safest, most cost-effective human spaceflight vehicle, Soyuz spacecraft were used to carry cosmonauts to and from Salyut and Mir Soviet space stations, and are now used for transport to and from the International Space Station. At least one Soyuz spacecraft is docked to ISS at all times for use as a craft in the event of an emergency. The spacecraft is intended to be replaced by the six-person Federation spacecraft, the orbital and service modules are single-use and are destroyed upon re-entry in the atmosphere. The orbital and reentry portions are habitable living space, Soyuz can carry up to three crew members and provide life support for about 30 person days. The life support system provides an atmosphere at sea level partial pressures. The atmosphere is regenerated through KO2 cylinders, which absorb most of the CO2 and water produced by the crew and regenerates the oxygen, the vehicle is protected during launch by a payload fairing, which is jettisoned along with the SAS at 2-1/2 minutes into launch. 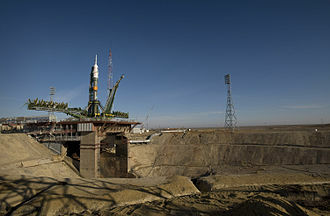 Baikonur Cosmodrome is a spaceport located in southern Kazakhstan. It is the worlds first and largest operational space launch facility, the spaceport is located in the desert steppe of Baikonur, about 200 kilometres east of the Aral Sea and north of the river Syr Darya. It is near the Tyuratam railway station and is about 90 metres above sea level, currently leased by the Kazakh Government to Russia until 2050, the spaceport is managed jointly by the Roscosmos State Corporation and the Russian Aerospace Forces. The shape of the area leased is an ellipse, measuring 90 kilometres east–west by 85 kilometres north–south, with the cosmodrome at the centre and it was originally built by the Soviet Union in the late 1950s as the base of operations for the Soviet space program. Under the current Russian space program, Baikonur remains a busy spaceport, with commercial, military. All manned Russian spaceflights are launched from Baikonur, both Sputnik 1, the first artificial satellite, and Vostok 1, the first manned spaceflight, were launched from Baikonur. The launch pad used for missions was renamed Gagarins Start in honor of Russian Soviet cosmonaut Yuri Gagarin, pilot of Vostok 1. The Soviet government issued the decree for Scientific Research Test Range No.5 on 12 February 1955 and it was actually founded on 2 June 1955, originally a test center for the worlds first intercontinental ballistic missile, the R-7 Semyorka. NIIP-5 was soon expanded to include facilities for space flights. The site was selected by a led by Gen. Vasily Voznyuk, influenced by Sergey Korolyov, the Chief Designer of the R-7 ICBM. It had to be surrounded by plains, as the control system of the rocket required receiving uninterrupted signals from ground stations hundreds of kilometres away. Additionally, the trajectory had to be away from populated areas. Also, it is an advantage to place a space launch site closer to the equator, taking these constraints into consideration, the commission chose Tyuratam, a village in the heart of the Kazakh Steppe. 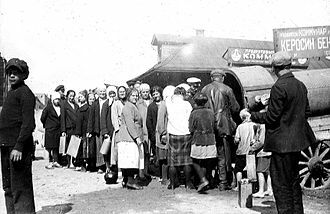 A supporting town was built around the facility to provide housing, schools and it was raised to city status in 1966 and named Leninsk. The LK was a piloted lunar lander developed in the 1960s as a part of the Soviet attempts at human exploration of the Moon. Its role was analogous to the American Apollo Lunar Module, several LK articles were flown without crew in Earth orbit, but no LK ever reached the Moon. The development of the N1 launch vehicle required for the Moon flight suffered setbacks, as a result, both the N1 and the LK programs were cancelled without any further development. Sergei Korolev, the lead Soviet rocket engineer and spacecraft designer during the 1950s and 1960s, the Lunar expedition spacecraft L3 consist of LOK Lunniy Orbitalny Korabl Command Ship and LK Lander. L3 would carry a two-man crew atop a single three-stage superheavy N-1 booster, a fourth stage, the Blok G, would push toward the Moon the L3 with Blok D as fifth stage. The Block D engine would slow the L3 into lunar orbit, following the coast to the Moon, one cosmonaut would spacewalk from the LOK to the LK lander and enter it. He would separate the Block D stage and the LK from the LOK before dropping toward the Moon using the Blok D engine. An earlier unmanned probe of the Luna programme, a Lunokhod would be used to select a suitable area, a backup LK would be launched to the landing site. The third step would see a manned LK landing with a single cosmonaut, most likely, the cosmonaut would plant the Soviet flag on the Moon, collect soil samples, take photographs, and deploy a few small scientific packages. Long duration missions, lunar rovers, and other activities performed on the late Apollo landings were not possible at all, after a day on the lunar surface the LKs engine would fire again, using its landing leg structure as a launch pad. To save weight, the used for landing would blast the LK back to lunar orbit for an automated docking with the LOK. The cosmonaut would spacewalk back to the LOK carrying the Moon rock samples. After this, the LOK would fire its rocket for the return to Earth, due to weight restrictions, the docking interface was designed to be as simple as possible, with a strictly mechanical interlock and no electrical or fluid connections. Liquid oxygen—abbreviated LOx, LOX or Lox in the aerospace and gas industries—is one of the physical forms of elemental oxygen. Liquid oxygen has a blue color and is strongly paramagnetic. Liquid oxygen has a density of 1.141 g/cm3 and is cryogenic with a point of 54.36 K. Because of its nature, liquid oxygen can cause the materials it touches to become extremely brittle. Liquid oxygen is a powerful oxidizing agent, organic materials will burn rapidly and energetically in liquid oxygen. Further, if soaked in liquid oxygen, some such as coal briquettes, carbon black, etc. can detonate unpredictably from sources of ignition such as flames. Petrochemicals, including asphalt, often exhibit this behavior, the tetraoxygen molecule was first predicted in 1924 by Gilbert N. Lewis, who proposed it to explain why liquid oxygen defied Curies law. Modern computer simulations indicate that there are no stable O4 molecules in liquid oxygen, O2 molecules do tend to associate in pairs with antiparallel spins. Conversely, liquid nitrogen or liquid air can be oxygen-enriched by letting it stand in air, atmospheric oxygen dissolves in it. In commerce, liquid oxygen is classified as a gas and is widely used for industrial and medical purposes. Liquid oxygen is obtained from the oxygen found naturally in air by fractional distillation in an air separation plant. Liquid oxygen is a cryogenic liquid oxidizer propellant for spacecraft rocket applications, usually in combination with liquid hydrogen. Liquid oxygen is useful in this role because it creates a specific impulse. It was used in the very first rocket applications like the V2 missile and Redstone, R-7 Semyorka, Atlas boosters, many modern rockets use liquid oxygen, including the main engines on the now-retired Space Shuttle. U. S. Army has long recognized the importance of liquid oxygen. In 1985 it started a program of building its own facilities at all major consumption bases. By 1845, Michael Faraday had managed to liquefy most gases known to exist, six gases, resisted every attempt at liquefaction and were known at the time as permanent gases. Zond (Soyuz 7K-L1) circumlunar spacecraft. Montage of a UK Defence Intelligence assessment of the R-26 ICBM. 1961 sketch showing 10 C-1 launches required to assemble in Earth orbit an Apollo lunar landing mission. The hypergolic fuel hydrazine being loaded onto the MESSENGER space probe. The attendant is wearing a full safety suit due to the hazardous materials. The first hypergolic-propellant rocket engine used for human flight, the Walter 109-509A of 1942–45.